​This page is dedicated to my massage and body work practice. For those of you wondering: "what is an NTS/LMT, anyway?" I hope that you will be able to find the answers you're looking for on this page. There is also a list of modalities I have studied lower on the page. An NTS is a Natural Therapeutics Specialist, this includes all forms of massage therapy, as well as herbal medicine, homeopathic medicine, essential oils, healthy nutrition and lifestyle. There is also an emphasis on the simple concept of being present and listening to one another which is quite possibly the oldest and most taken for granted of any basic Human Skills. An LMT is a Licensed Massage Therapist, one who has completed a state/national standard allowing one to offer touch therapy to others. My experience of massage therapy goes way back to my childhood, my mother is also an NTS/LMT therefore I have had lifelong exposure and educational opportunities. 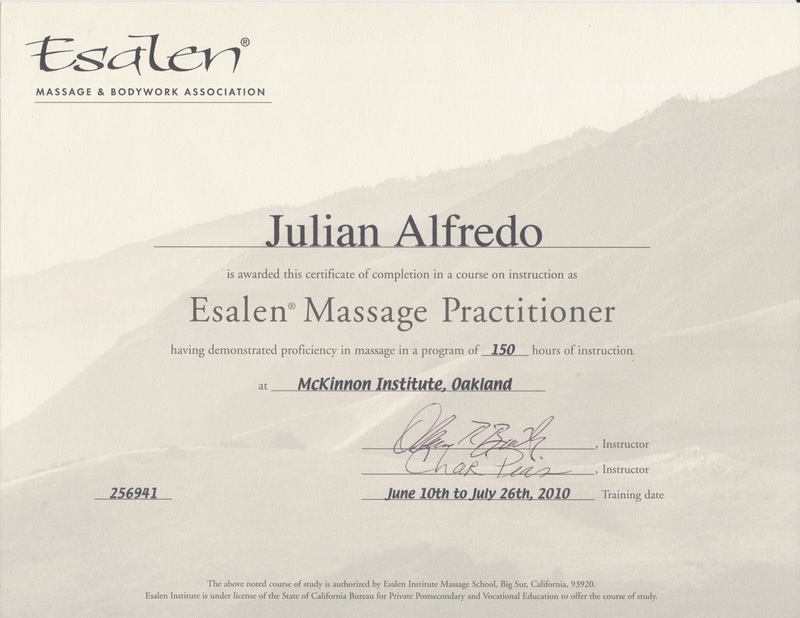 I began "official training" in a classroom in early 2010 and up until now have acquired over 1500 certified hours (most states in the US require 500hr minimum) in various massage practices as well as anatomy/physiology nutrition, herbal medicine, emotional support skills, and Naturopathic Theology. 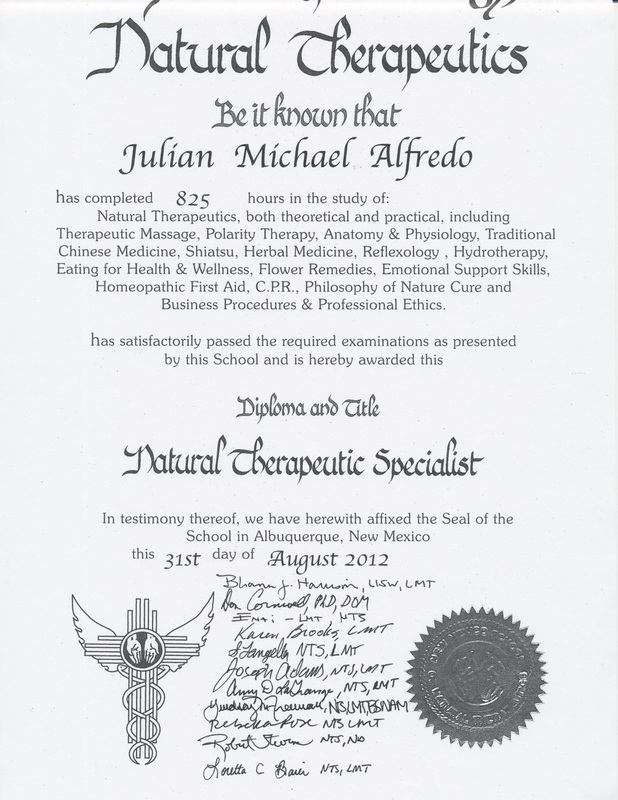 ​﻿﻿Why Natural Therapeutics and Massage Therapy? ﻿﻿To start, it feels great! Although massage/bodywork is generally considered to be an alternative or complimentary medicine, from the the naturopathic point of view it is considered a preventive medicine, which means that you don't even have to be experiencing any problems to receive it! It is however, the oldest and the most intuitive. Massage therapy's first documented appearance in history dates back to 2330 BC. Polarity is a modality of body-work emerging from Ayurvedic Medicine, in-which we see the body more or less as a series of magnets. In treatment we are creating currents from one point to another around a specific area, for example: If the client is experiencing shoulder problems we make connections around the shoulder, on the ends of the muscles which help to move this complex joint. Along with the "current theory" we are also applying varying pressure and other physical manipulation of the tissue to the focus area with the intention of creating a smoother flow . (rhythmic tapping), friction (cross fiber) and vibration/shaking. Swedish massage has shown to be helpful in reducing pain, joint stiffness, and stress. The term "Swedish" massage is actually only recognized in English and Dutch speaking countries, and in Hungary. Elsewhere (including Sweden) the style is referred to as "classic massage". This style is often referred to as a "regular massage". CST was developed by John Upledger, D.O. in the 1970s, and is loosely based on osteopathy in the cranial field (OCF), which was developed in the 1930s by William Garner Sutherland. CST is a form of bodywork or alternative therapy which focuses on the concept of primary respiration and the regulation of cerebrospinal fluid "flow" by means of therapeutic touch. To do this we are very gently stimulating the synarthrodial joints in the cranium (our skulls are not merely one bone, they in fact consist of 22 bones) as well as the intraspinal joints between the skull and sacrum (aka tail-bone) while practicing deep relaxation techniques such as meditative breathing. (Japanese-shi meaning finger and atsu meaning pressure) is a type of alternative medicine or "hand medicine" consisting of finger and palm pressure, stretches, and other massage techniques and ultimately stems from TCM. Or Nuat Thai – is unique among massage therapies in combining both physical and energetic aspects. It is a deep, full-body massage progressing from the feet up, and focusing on sen-sib or energy lines throughout the body, with the aim of clearing blockages in these lines, and thus stimulating the flow of blood and lymph throughout the body. By the end, one feels both relaxed and energized, in an almost dreamlike state, and typically without pain. In short, it is a unique form of Buddhist physiotherapy that blends yoga, acupressure and reflexology. Esalen Massage was developed at the Esalen Institute in beautiful Big Sur, California and is based on a combination of many massage and bodywork techniques. The two main influences were Swedish massage and the Sensory Awareness work of Charlotte Selver. Esalen Massage works with gentle rocking of the body, passive joint exercises and deep structural work on the muscles and joints, together with an energetic balancing of the body. Prenatal massage has shown great results for mothers and newborns, this is a very gentle modality which can help pregnant mothers relax as well deal with typical aches and soreness associated with pregnancy. It may also ease the birthing process. Pediatric massage is preferably taught to the new mother (and father) and can increase motor skills in the child as well as create strong bonding between the parent and child.